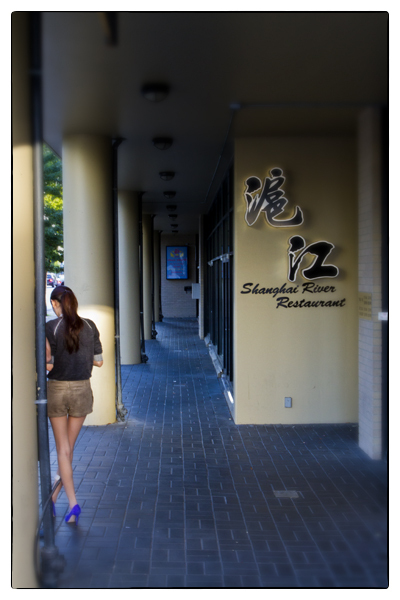 The girl with the purple stilettos outside Richmond's Shanghai River Restaurant. Photos by David Lansing. Laura says, If you’re not too tired when you get to your hotel, go to the Shanghai River Restaurant and get the shrimp dumplings. Okay, here’s the thing: It’s after eight. You don’t do dim sum at night. You do dim sum in the morning. But I know what she’s getting at. If you want to know if a certain Mexican restaurant is any good, order the chile relleno. If they can do that right (and few can) they can do anything. 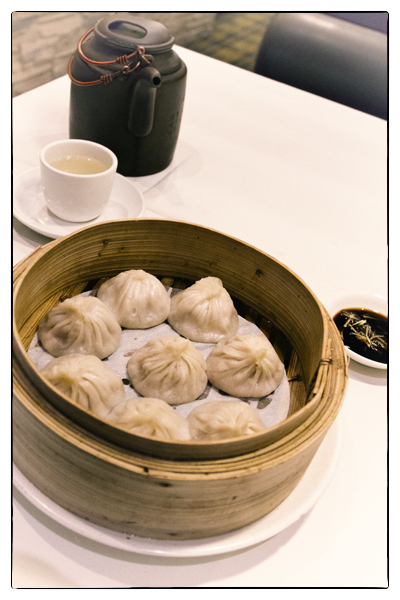 If you want to know if a dim sum place is any good, order the shrimp dumplings. When I get to Shanghai River there’s a 30-minute wait. Even though it’s after 8:30. There’s a family of 13 draped across every chair in the lobby so I stand outside, on the sidewalk, next to a stylish young woman with dramatically long legs perched atop purple stiletto heels texting on her phone. She looks up at me. “Waiting for a table?” she asks. “Just the shrimp dumplings,” I tell her. Shrimp dumplings at the Shanghai River Restaurant. Photo by David Lansing. She hurries inside the restaurant without saying a word and comes back a minute later with the manger on her arm. She says something in Cantonese while pointing at me. The manager nods and waves his arm for me to follow him. The manager and the woman in the purple stilettos take me to a part of the kitchen with a glass wall facing the dining room. Two cooks are pinching together dumplings. The manager says something to the cooks and a few minutes later, I’m presented with a bamboo steamer filled with eight shrimp dumplings and a little dish of XO sauce. I pick up a dumpling with my chopsticks, dip it lightly in the XO sauce, and take a bite. “Well?” says the woman in the purple stilettos. “Best damn shrimp dumplings I’ve ever had,” I tell her. She laughs and says something in Cantonese to the manger. He laughs as well. “What did you tell him?” I ask her. And she’s right. I will.